Japan welcomes numerous religious faiths, and while its society is increasingly secular, two religions are intimately interwoven in the country’s history. Shinto is the indigenous religion, and Buddhism arrived in the sixth century. Each has distinct variations, and the two are often practiced together. Shinto Shrines and Buddhist Temples liberally dot urban and rural Japan. They are stunningly beautiful, meticulously crafted, ancient works of art. My favorite is Rokkakudo, a tiny hexagonal Buddhist Temple, nestled among tall modern buildings in downtown Kyoto. It was originally built in the late sixth century. Its small plot features a pond with koi fish and swans, a fountain shaded by a cherry tree trained in the shape of a wide parasol, and a weeping willow tree upon which people tie their fortunes for good luck. Other tinier shrines dot the grounds, and a small gift shop is staffed by temple monks and two very sweet women. Rokkakudo is the birthplace of ikebana, the custom and art of arranging flowers in a vase. Pigeons love this little place. Considered flying rodents and discouraged at most city buildings, the pigeon is embraced at Rokkakudo, which has made the bird its symbol. Bags of seed are sold to feed the motley selection of gray, blue, white, and brown birds in the resident flock. In the temple’s six-sided main hall, a half-buried brass Buddha peers from a jumble of religious accoutrements that looks more like a crowded antique store than an altar. It is cool, dark, and screened to keep those flying symbols from getting in and wreaking havoc. When we visited in March 2010, the parasol-shaped cherry tree was in full flower to our utter delight and amazement. The surroundings are more subdued in November, but the swans, fish, and pigeons each offer their own poetic grace. To the left of the temple is a long row of assorted, short stone statues. Most are clothed in a red bib tied around the ‘neck’ and a knitted cap covering the ‘head.’ These statues are representations of Jizo. Jizo Bosatsu (Bodhisattva) is revered in Japan. He achieved enlightenment long ago but refuses to become a Buddha until everyone is saved. He’s something of a jack of all trades, helping just about anyone with anything to ease suffering, though he is particularly associated with children and expectant mothers. Japanese Buddhism has refined Jizo’s role to become the guardian of all unborn, aborted, miscarried, and stillborn children. In Buddhism, it is the Karma individuals accumulate on earth that helps them cross the Sanzu River to reach the afterlife. Without sufficient good deeds, the dead must pile rocks by the river in hopes of proving their worth and obtaining passage. Evil spirits often knock these piles down, frustrating efforts to cross over. Babies and young children have not built up Karma, plus their deaths caused their parents much pain. This puts them at a distinct disadvantage. Grieving parents appeal to Jizo, dressing him in cap and bib for the protection of their poor child, seeking his assistance. Sometimes small stones are placed near the statue to further their child’s task and help her cross the river quickly. Small toys are often left there too. At Rokkakudo, there is a lump of rock no longer discernible as a Bosatsu figure (if it ever was) adorned with a fresh red cap and bib. A small round rock has been placed in front of this mossy Jizo, and by its side is an old stuffed toy, a dog, faded and moldered, looking as though it, too, is slowly turning to stone. The following week, Kate and I are in Tokyo walking through Zojoji Temple to the Tokyo Tower. Passing rows of small Jizos, our attention is arrested by an unexpected flash of bright blue fabric. A brand new Jizo statue is smartly clothed in a red-and-white striped, long-sleeved oxford shirt. Over this is a sky blue puffy vest with a hood by Mountain Camp. The shirt’s cuffs are tucked into the vest’s pockets. Fresh flowers and a colorful pinwheel are placed on either side. Amid rows of traditional statues bearing faded red bibs and knit caps, this hip little Jizo stands apart, starkly different and so adorable. He would fit right in with the chic bustle of Tokyo’s streets. As an outdoor gear enthusiast, the sight of his puffy vest is just too cute. I cannot resist the urge to smile. The reaction tempers quickly, however. I understand quite well the deep stab of sorrow he represents. Somewhere in this city are two loving parents with heavy hearts and empty arms. This is an exciting day, the most important prep day of all — travel day. By evening we’ll be in position to formally begin our AT hike the next morning. Clarence and I are meeting at Mary’s house for a final gear check that will center on our food for the first five days, personal needs for our midpoint overnight in Gatlinburg, and food/clothing resupply for the second portion of the hike. We need to have everything organized for efficiency. Due to the size of Great Smoky Mountains National Park, some areas are more remotely located and thus require quite a bit of travel time to access. This is particularly true of southwestern sections in North Carolina. There is simply no easy way to get there from just about anywhere. Our northbound route on the AT, which is actually more eastbound through the park, will require a two hour drive over Hwy. 441 into Cherokee, then along Hwy. 19 through Bryson City to Hwy. 28 and our destination in Fontana. Susan and Allen Sweetser will drive us. After a couple of last minute errands (for more ibuprofen and a belt at the NOC store in Gatlinburg), we stop at Sugarlands to turn in a backcountry camping permit with our shelter schedule and reservation number. At Newfound Gap we drop off my car, and everyone piles into the Sweetser’s vehicle. 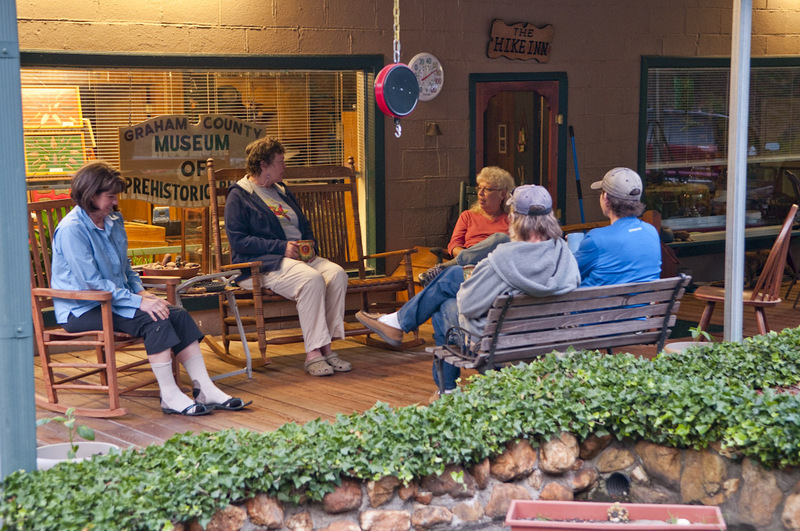 We are making good time and opt for a quick side trip to the original Nantahala Outdoor Center, now a sprawling complex featuring a restaurant, equipment rental, and retail goods. We walk around a bit before a thunderstorm drives us inside where I buy a Buff to use as a lightweight nightcap if needed. We are spending the night at The Hike Inn, a quaint establishment that has accommodated hikers for 20 years. Owners Jeff and Nancy Hoch provide highly personalized service that includes shuttles to and from the trail, a trip to town for food and supplies, mail drops, laundry, and clean, comfortable private rooms with baths. Small details catch our attention: satellite TV tuned to the weather, coffee maker, big bottle of shampoo, shaving cream, assorted books for light reading, and most interesting of all — toenail clippers, what a through-hiker would really need on occasion but is not likely to carry. A hanging scale on the porch lets hapless hikers put a number on their back pain. 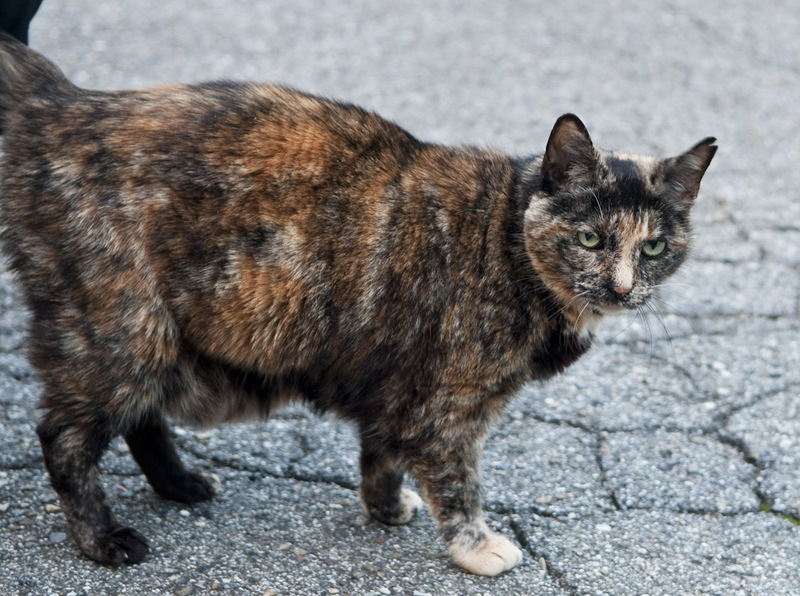 The Hochs take in animals as well as hikers owning five dogs and several cats, including Shasta, a friendly tortoiseshell kitty who hasn’t met a hiker she doesn’t like. Before and after our Mexican dinner in Robbinsville, we enjoy the mild evening on The Hike Inn’s front porch and chat at length with Nancy and Jeff. They have many entertaining anecdotes from their 20 years living on Highway 28 and a few horror stories about the motorcyclists that roar by all day on their way to the infamous Tail of the Dragon, Hwy. 129, nearby. Darkness eases across the sky, and the mountain air cools. We retire for a restful night’s sleep. 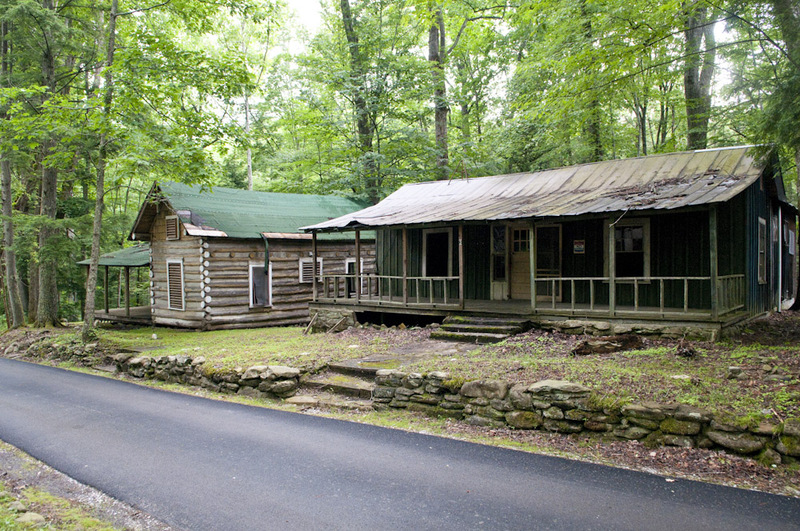 The Higdon (right) and Sneed cabins in the Daisy Town area of Elkmont are two summer resident cabins to be restored under the park's management plan. The cultural history of the mountains can be found just about anywhere in the park. Usually the sign is subtle — a pile of stones, pieces of metal rusting half-hidden in leaf litter, clumps of daffodils or daylilies, a worn path to a small cemetery. There is nothing subtle about Elkmont, however. Few places have retained the ‘hand of man’ quite like this area, though that is now changing. The establishment of the park created much heartache and strife among the many families living year-round within its boundaries who had to relocate in the 1920s and 1930s. 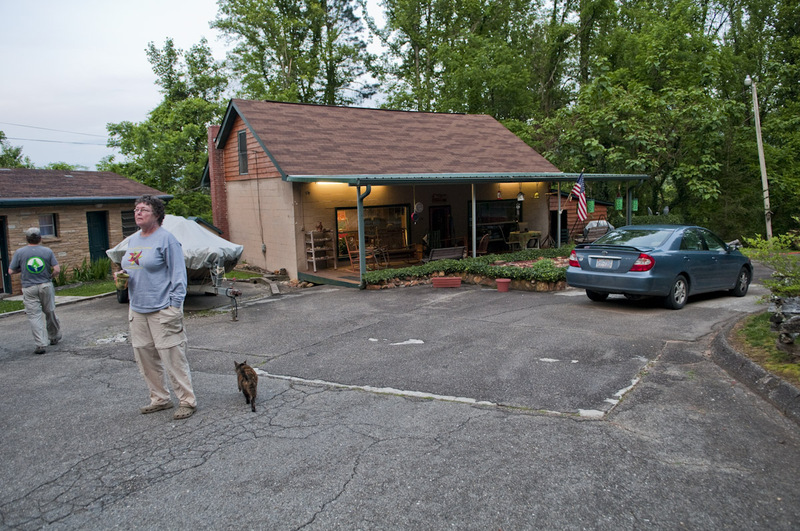 That angst was delayed a few generations for the summer residents of Elkmont. 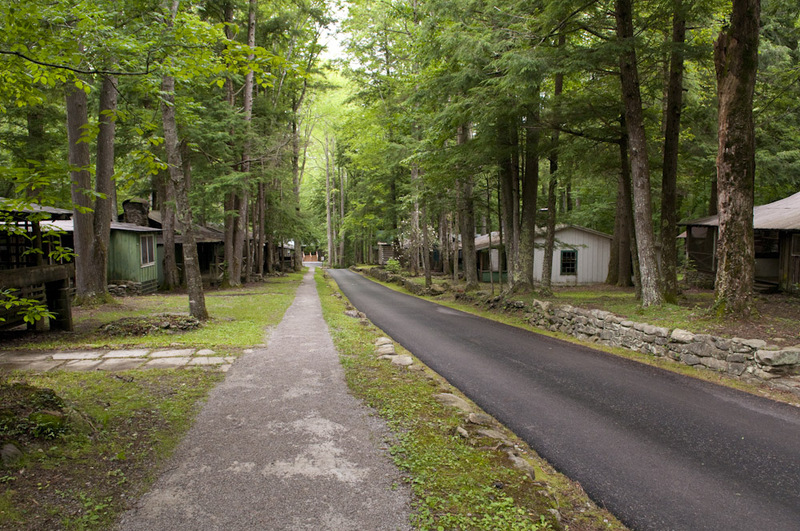 The freshly paved loop road through Daisy Town is lined with 16 structures representing the resort community history of Elkmont. In 1901, Col. W.B. Townsend bought 86,000 acres of land in the Little River area and established a lumber and railroad company by the same name. The community that sprang up around logging operations was initially called Tarpaper Camp, little more than shanties erected for employees and the necessary commerce to supply them. As work moved further up the valleys, Townsend marketed the cleared land to folks looking for a “mountain getaway.” He knew the interest was there. From the beginning, he had allowed well-heeled hunters and fishermen to ride in the caboose of his trains from Walland to the camp, permitting them weekend access to game and streams. 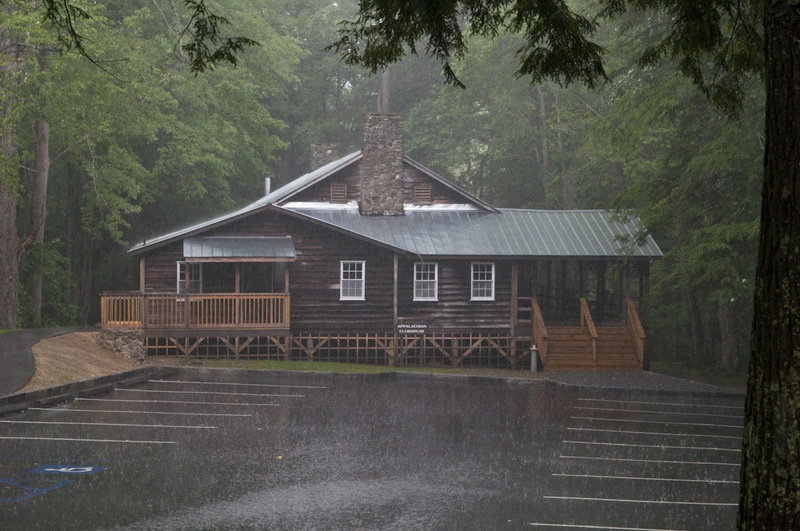 The newly restored Appalachian Clubhouse as viewed from the porch of the Smith Cabin during a brief rain shower. Many of these outdoorsmen were members of the Elks Club in Knoxville, a philanthropic and social fraternity. Their destination became known as Elk Mountain, later Elkmont. Within a few years, their wives wanted to visit too. Townsend was happy to sell them logged property. The men formed a private club in 1907 and built a lodging and meeting facility – the Appalachian Clubhouse – in 1908. These weekend families began to build small cabins or renovate set houses left behind by Little River Company. The regular train trip from Knoxville to Walland followed by the logging train ride up to Elkmont could take as long as four hours. Townsend upgraded the accommodations on his leg of the trip from a caboose to an observation car and, finally, passenger coach. The great room of the Wonderland Hotel Annex. Looking to expand the possibilities, Townsend offered land overlooking Elkmont for the construction of a hotel. Wonderland Hotel opened in 1912 for public use. The Appalachian Club was very exclusive, and some spurned would-be members bought the hotel in 1919 establishing the Wonderland Club. A few private cabins were built behind the hotel. In the meantime, members of the Appalachian Club were spreading up Jakes Creek and along Little River. Three distinct areas emerged. Those cabins on either side of the loop road (about 16 of them) adjacent to the clubhouse were known collectively as Daisy Town. The stretch of cabins rising up between Jakes Creek and Jakes Creek Road was referred to as Society Hill. Those built along Little River were dubbed Millionaire’s Row. Most of the cabins of Society Hill are slated for demolition including the Andrews-Sherling Cabin. 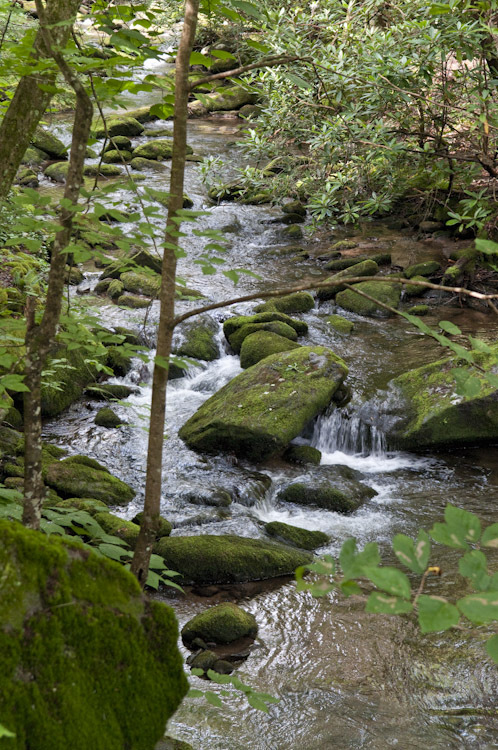 In the 1920s, the push to establish a national park in the Smoky Mountains gained momentum thanks to the work of Knoxvillians like Willis P. Davis and his wife Ann and Col. David C. Chapman. Chapman loved the idea of a park where anyone could come enjoy the mountains. Others were less enthused. Attorney James B. Wright was one of the cabin owners in Elkmont who preferred a national forest designation to keep the masses out in favor of strict conservation, which would also keep his land safe from condemnation and eminent domain. He represented some of the Appalachian Club members who opposed the park idea. Wright lost his argument and promptly sold his cabin to another family. The Miller Cabin on Millionaire's Row (with "tree" shutters) was originally built by Col. Townsend and features horse stables on the ground level. The property of original mountain landowners throughout the proposed park’s footprint was typically bought outright, and the farm families had to move. In Elkmont, though, Col. Townsend agreed to sell his lumber acreage with the provision that he could continue logging it for several more years. Summer cabin owners obtained lifetime leases in exchange for lower purchase prices. Farm families were offered the same deal, but under the agreement, they were not allowed to use the land’s resources, affectively denying them any means of self support. Selling and moving became the only viable option for most. In 1952, Elkmont owners, who could make money renting out their cabins, made a deal with the National Park Service. If they could get electricity from Sevier County, they would exchange their life leases for a 20-year agreement. As 1972 approached, they began lobbying heavily for another 20-year extension, which they won over the objections of park officials and environmentalists. As 1992 approached, they again tried for extensions, this time without success. The leases expired on all but a few who had refused to cooperate in earlier negotiations. The last of those expired in 2001. The Wonderland Hotel closed its doors in 1992. Screen door and porch details of the Matthews Cabin on Society Hill. 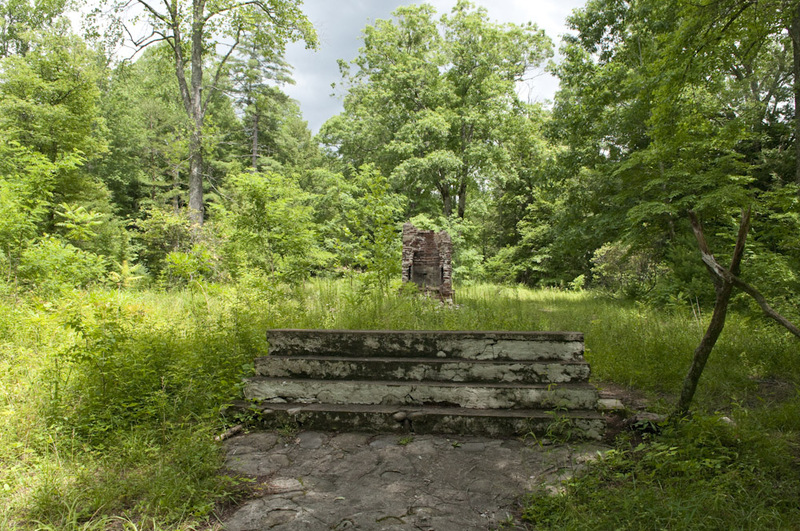 The park’s General Management Plan called for the removal of all structures and restoration of natural areas in Elkmont. 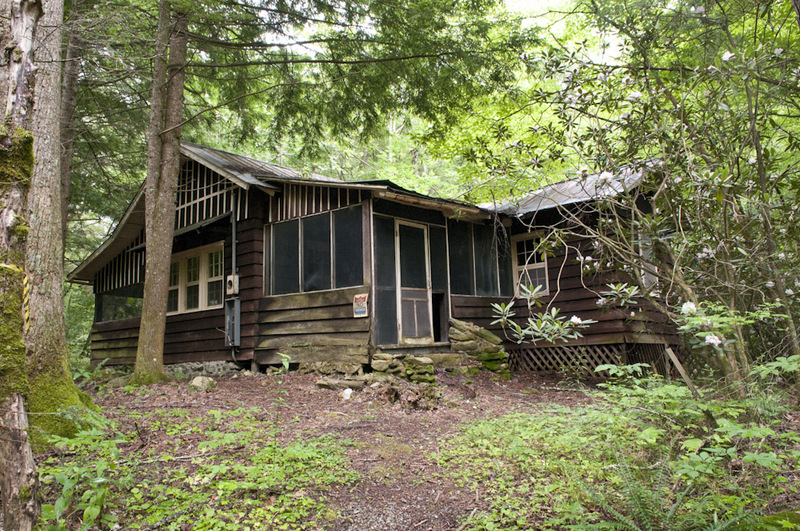 Cabin owners, many of whom had hoped the buildings would be preserved and rented to the public, sought to thwart this in 1994 by nominating several structures to the National Register of Historic Places. They argued that the resort community was a viable part of the park’s history that should be preserved. The rancor that ensued over the next 15 years has left many people bitter for a variety of reasons. As the debate dragged on, former “Elkmonters” saw NPS’s actions as “demolition by neglect.” All of the structures have suffered varying degrees of degradation from the elements. The Wonderland Hotel, one of the National Register sites, collapsed from structural failure in 2005. Some components were salvaged, but the main hotel building had to be razed. Steps and a crumbling chimney are all that remain of the original Wonderland Hotel. In the late 1990s, park officials twice proposed plans for the area that were rejected by state (Tennessee) and national preservation groups. In the first decade of the 21st century, the park undertook an impact study that evaluated seven alternatives for the area including total removal on one end of the spectrum and total preservation on the other, with costs ranging from $1.3 to $30 million. In 2006, they put forth the selected option at $6 million, and in 2009, began implementing that plan. 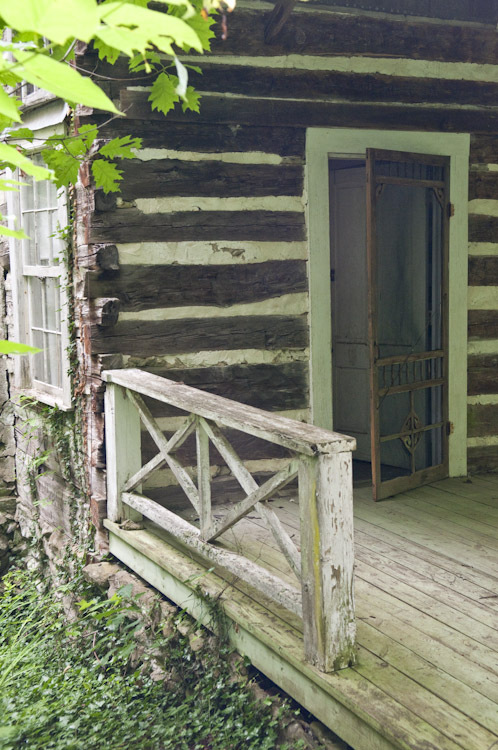 The Spence Cabin on Little River is currently undergoing restoration and will be available for day use. It calls for the preservation of 19 structures. All buildings on the Wonderland Hotel site are to be removed and the natural area restored. 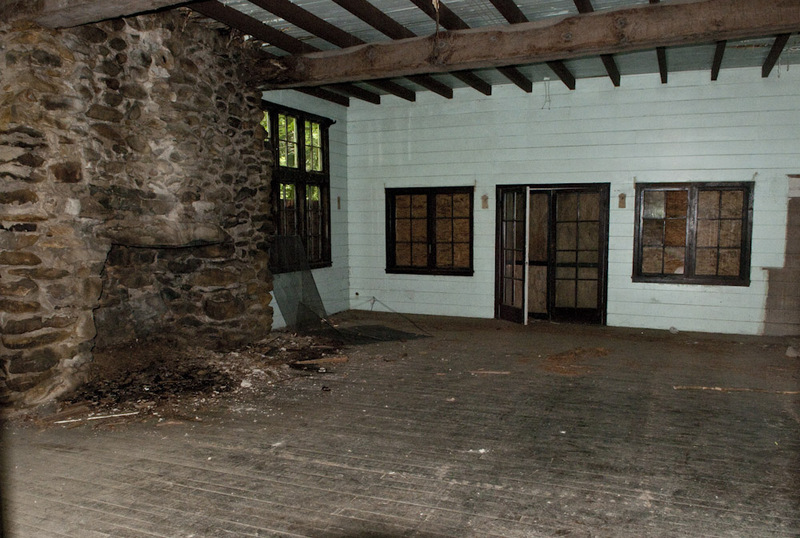 The Spence Cabin on Millionaire’s Row is currently undergoing restoration. All others will be removed. 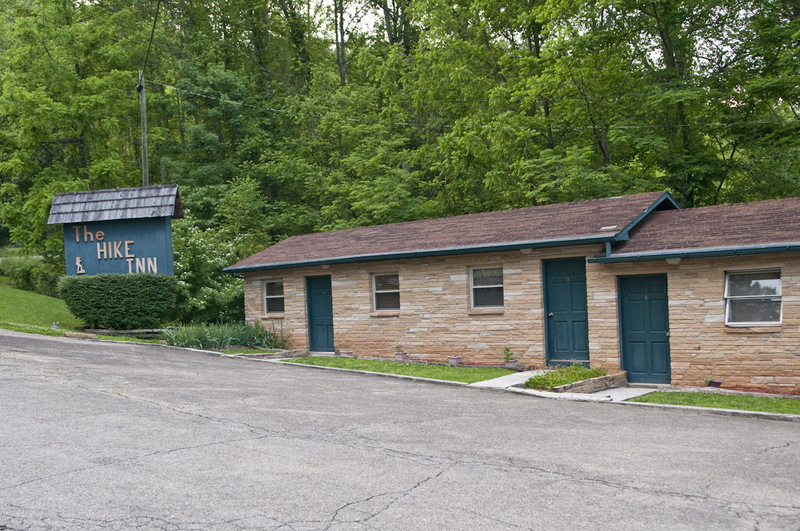 In the Daisy Town area, the Appalachian Clubhouse’s restoration is complete with adjacent parking and restroom facilities added. The 16 houses along the loop road have been stabilized and will be restored as funding permits. Three buildings have been removed for Jakes Creek Trailhead and Daisy Town parking. On Society Hill, one cabin – #38 Byers/Chapman (the man who tirelessly promoted the park idea) – will be restored and the rest removed. 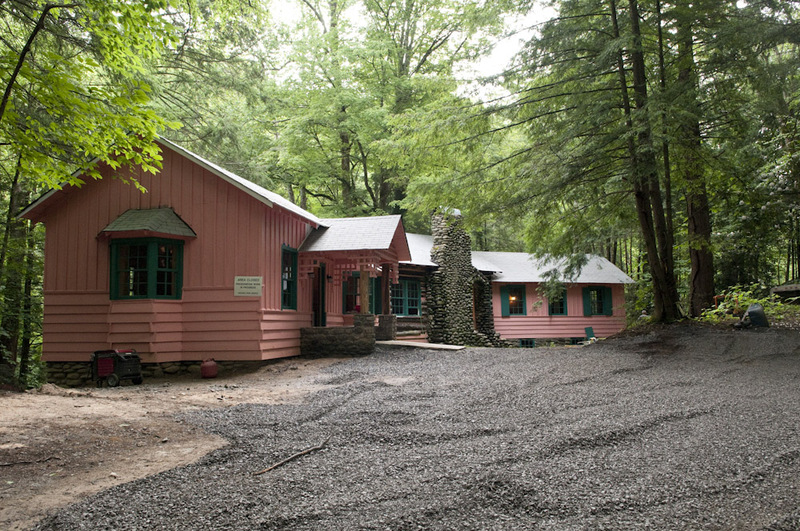 The Spence Cabin and Appalachian Clubhouse may be rented by the public for day use. There will be no overnight accommodations. Interpretive signs and kiosks will tell the story of Elkmont. 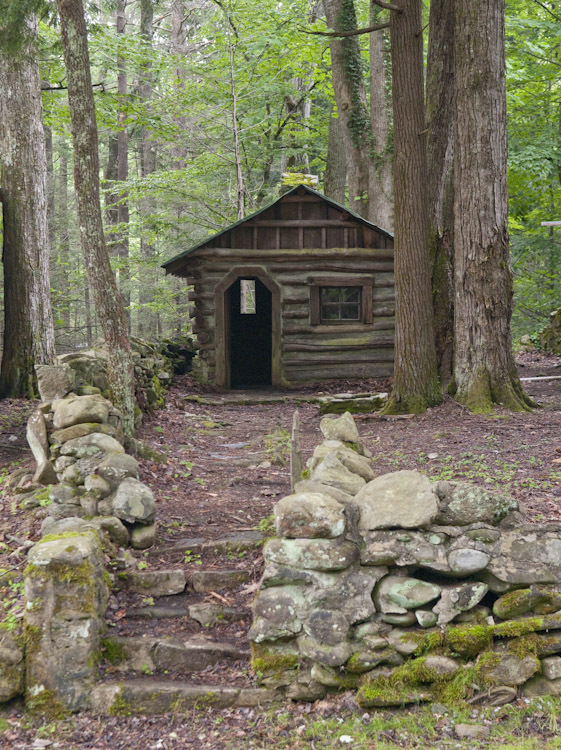 The child's playhouse "Adamless Eden" between two cabins in Daisy Town was reportedly built in 1921. 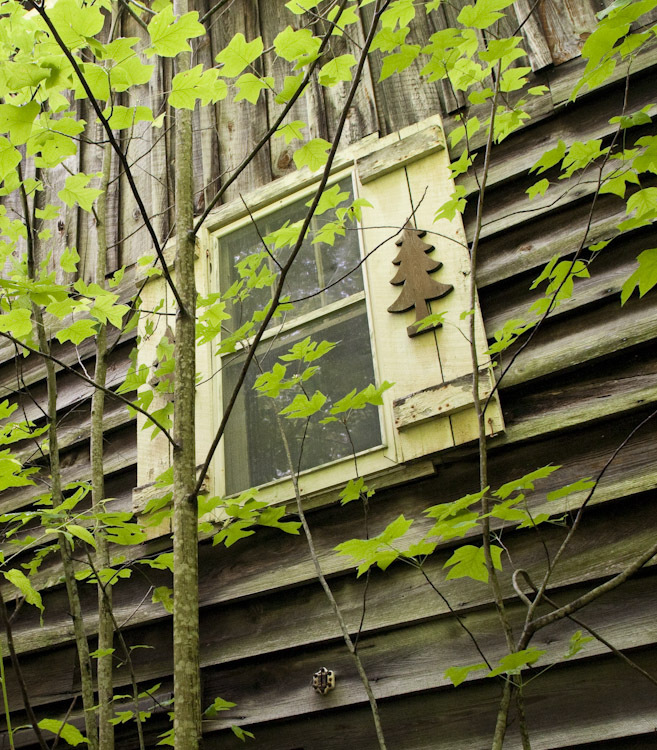 The cabins, those that have been saved and those awaiting demolition, are an interesting assemblage of cute, spare, welcoming, ugly, graceful, sprawling, tiny testaments to an undeniable part of the park’s history. Many sport a hodgepodge of additions, little rooms and porches tacked on and strung out over the years like a rabbit warren. Those in Daisy Town are easier to view since vegetation is managed there. Up Society Hill and Millionaire’s Row, nature is aggressively pushing back. Some are nearly obscured from view. Others are virtually falling in on themselves – collapsed porches, leaning chimneys, yawning doorways. It is a sad sight to see, but I support the park’s plan. And yet I can’t help but envy those “Elkmonters” who got to spend all summer playing in the Great Smoky Mountains year after year. Higdon relative Cindy Hill Springs described it as “a magical place for a child to grow up.” No doubt. The view of Jakes Creek "Elkmonters" along Society Hill enjoyed from their back porches each summer. On the Sunday following my hikes, helping Ken McFarland prepare for the 60th Spring Wildflower Pilgrimage consumes my days and evenings. All thoughts of the trails disappear as Ken’s friends Carol and Dave Mongold and I work on registration boards, leader packets, and history posters. Native plants are groomed and their pots washed for the display at the convention center. Once these preparations are complete, the Pilgrimage itself begins as people from near and far come to enjoy walks in the Great Smoky Mountains National Park led by experts on plants, insects, mammals, fungi, salamanders, history, medicinal uses, and nature sketching. I am fortunate enough to be a wildflower walk leader. My son, Sam, a junior in college at UT, joins me for the weekend and got his first taste of the Smokies. Now he loves it, too! On Ash Hopper Branch, the manway across Little River Road from Sugarlands Visitors Center, we find Alternate-leaved Dogwood, Vasey’s Trillium in flower, Pennywort, Umbrella Magnolia among many others, including Spring Avens (Geum vernum), a new plant for me, identified with the help of a Pilgrim! The Pawpaws are in flower on the Quiet Walkway, and Cucumber Gap has lots of young Yellowwood trees. By the end of that week, there are few Fringed Phacelias left on Porters Creek, and the Large White Trilliums are well past their prime and fading fast. To make up for that deficit, the now famous “Painted Trillium Rock” has about 30 plants in fresh flower studding the mossy surface and looks spectacular. Only three of them were visible on my hike the week prior, and I feared some plants had been taken from the rock. Those fears are alleviated at the sight of all those flowers and the additional 12-15 plants not yet mature enough to flower. 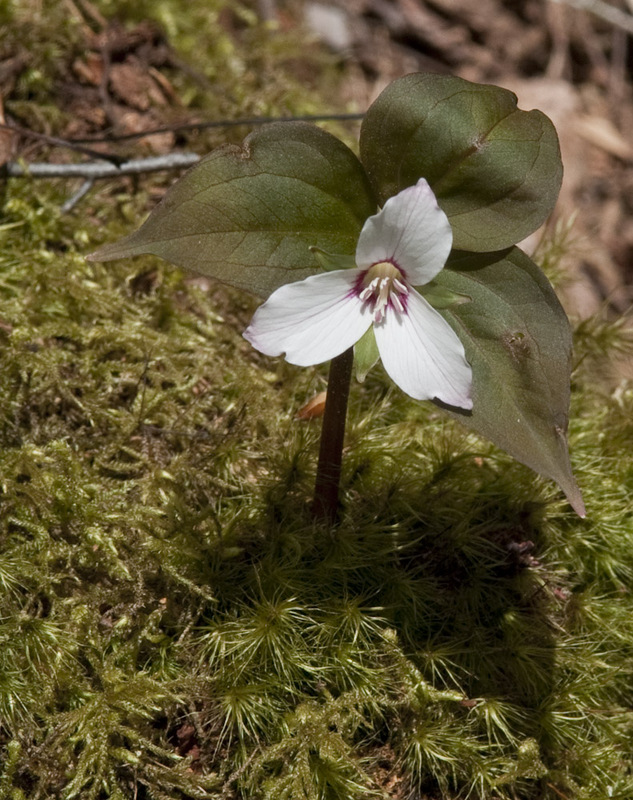 However, one hiker is spotted coming down the trail with two picked Painted Trilliums in her hand. Thankfully, several other hikers spotted the plants and quickly and emphatically enlightened the perpetrator regarding her criminal actions. Not only is this clearly illegal in a national park, but picking a trillium removes the entire plant, leaves and all. The leaves are essential to recharge the roots for next year’s plant, and the flower is the source for future generations. 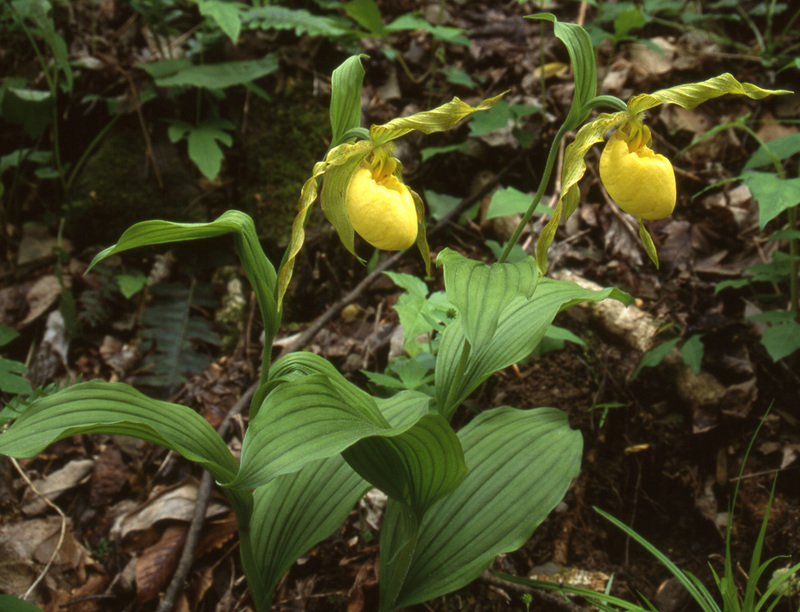 The two yellow ladies slippers of Ash Hopper, photographed in 2006. They were dug and stolen from the park two years later. It is a shame that a few people think their wants are more important than the enjoyment of millions of park visitors. Sometime in 2008, a selfish jerk dug and removed two yellow ladies slippers from Ash Hopper. These plants were side by side on a small embankment perfectly situated for close visual inspection, a camera and tripod, or an artist’s sketch. They were likely the most photographed and admired orchids in the park…..until that day in 2008 when they were stolen. At the Pilgrimage in 2009 and this year, I meet several eager photographers on that trail with tripods on their shoulders and the same inquiry on their lips, “Are the yellow ladies slippers in flower yet?” The look of disappointment and even anger on their faces when told the plants are gone is also uniform. This is why I will not reveal in this blog some plants I see on the trails. Most people value the park and its precious resources, but it only takes one creep to ruin it for everyone. More hikes are just around the corner! Next week I’ll be in the Greenbrier area with plans to get a few more trails under my belt before the Spring Wildflower Pilgrimage. Possibilities include Ramsay Cascades, Brushy Mountain, Rainbow Falls/Bull Head and Porters Creek. This time I’ll be able to “report” the trail experience in a more timely fashion, as I now have my daughter’s old MacBook. Each evening I can recount the day fresh off the trail – well, maybe after a shower and some dinner! I can hardly wait to plunge once more into the heart of this magnificent park and be surrounded by its beauty and serenity. I’m also looking forward to the five-day Pilgrimage and its impressive list of walks and activities. Many great friendships have developed from my seven year association with this event in the Great Smoky Mountains National Park. Some hard work is involved, but it is always lots of fun!! Plus, each year I pick up a little more general understanding and specific plant knowledge of the Smokies. I’ll help lead hikes on Ash Hopper, Cucumber Gap, Quiet Walkway, and Porters Creek this year. These trails are easy and offer lovely spots for spring wildflowers, rushing mountain streams, and wooded seclusion without trekking deep into the park. Twelve days of glorious mountains ahead…and it will pass all too quickly! Look for the first trail account the middle of next week. Family duties have been calling, and I’m way behind in posting blogs & photos on these latest hikes – got one more to go. I’m also revamping my photo software and the learning curve on things like this is steep for me. Patience, please. There will be lots of neat photos ready to add soon.